Here is the verdict of the Fans Panel after FC Halifax Town’s 0-0 draw at home with Woking. Man of the match – Difficult choice this week, as so many new players. My vote’s going to Scott Garner for grafting hard and doing everything asked of him. Moment of the match – Not long to go, and the ball breaks to Tom Denton in acres of space. He scuffs it wide from ten yards out, and the chance is gone. Our “back to basics” approach (it means try to make sure we don’t concede) inevitably meant chances would be few and far between. An utterly boring match against yet another try-hard-and-well-organised side. There’s so many in this league it’s untrue; not an ounce of flair between them! Moan of the match – Two this week; team selection being the main one. Playing with only one man up front is hardly likely to result in three points, especially at home. With Kosylo missing, we desperately needed Adam Morgan to open up the opposition, but he wasn’t even on the bench. Why not? The second point is the pathetic way the Woking players threw themselves to the ground whenever our defenders came near. The ref saw it all, but opted out of booking them even though the rules clearly state he should have. Man of the match - On his debut Josh Clackstone had a great game, he defended well and was a marked improvement on his predecessor. He helped achieve the first clean sheet in the league for a while. Moment of the match - Seeing Josh Wilde going off late in the match could be critical. He is certainly an contender for player of the season. Let’s hope he’s back soon. Moan of the match - Between the acting skills of certain players on the opposition team and a referee that can’t spot a hand ball close up, some of the enjoyment certainly went out of an otherwise positive afternoon. Man of the match - Scott Garner - Had his best game for a while. Woking never really came close to scoring. Scott led a decent defensive display for the Shaymen and contributed to a well earned clean sheet. 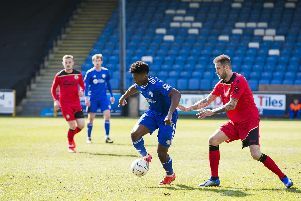 Moment of the match - 45th minute - An entertaining half time match in FCHT Community Schools competition was the highlight of the day. Sowerby won the game on penalties with the match finishing 2-2. Lots of attacking football. Moan of the match - Yet again the officials were clueless. How can they be the only people in the stadium not to see a Woking defender stop the ball with his hand in the penalty area? Shocking stuff. Man of the match - Tough to pick again, first half I was impressed with Middleton going forward, looked to play some nice passes however second half he was anonymous. Moment of the match - The final whistle! Very poor standard with hardly any incidents to recall from the match. Moan of the match - Why are we playing with one striker again? We played so much better with a partner alongside Denton but for some reason we’ve gone back to the old ineffective style.